When the Dodge Charger was reintroduced as a full sized four door sedan for the 2006 model year, some Mopar faithful grumbled about the addition of the “extra doors” but as the new Charger powers through its second generation with a sleek new exterior design – the only people who could question whether the 2012 Charger SRT8 car is deserving of the Charger name are those who haven’t been behind the wheel. The 2012 Dodge Charger SRT8 receives many of the same exterior changes as the non-SRT models with the key points being the huge “race track” taillights out back, the angry new face and the scalloping on the sides of the car that pay homage to the Chargers of the 1970s. Also, like previous SRT8 versions of the brawny street brawler, the 2012 Charger SRT8 features some unique design items like the vented hood and the wide, low front fascia. The crosshair grille from the non-SRT Chargers is right at home on the 2012 Charger SRT8 but with a black center bumper section separating the upper and lower grille areas – the SRT8 presents a far more aggressive look. This look is continued by the flared foglight openings that are set further to the outside of the car in the wide SRT-specific front fascia. Along the side, the 2012 Dodge Charger SRT8 receives more unique items, beginning with the massive 20” SRT design wheels wrapped in high performance rubber and flared side sills give the SRT Charger a lower stance and improved aerodynamics. Out back, the Charger SRT8 wears a slightly taller rear decklid spoiler than does the Charger R/T with a similar lower splitter holding prominent, round exhaust tips instead of the rectangular integrated tips found on the non-SRT Chargers. SRT badges on the grille and rear decklid along with the distinct 6.4L Hemi badging on the fenders finish off the upgrades to the 2012 Charger SRT8. Inside, the 2012 Dodge Charger SRT8 offers a surprising level of luxury for a high performance sport sedan beginning with the power, heated sport seats finished in leather and suede. That suede and leather finish is continued to the door panels and in my test vehicle, the Charger SRT8 was fitted with bright red interior finishes that contrasted nicely against the mostly-black interior. Like the other new Dodge Chargers, the 2012 Charger SRT8 sports the gorgeous, one piece dash board that encompasses the driver information center and the huge 8.4” touchscreen infotainment system. SRT-specific design cues inside include the embroidered logos on the front seat-backs, the SRT badged tachometer, the angular race inspired SRT steering wheel and the awesome SRT Performance gauges that work with both the 8.4” touch screen and the smaller screen nestled between the speedometer and tachometer. Like any Street and Racing Technology product, the main attraction of the 2012 Dodge Charger SRT8 is the drivetrain which centers around the incredible 6.4L, 392 cubic inch Hemi V8. Churning out an advertised 470 horsepower and 470lb-ft of torque, the Charger SRT8’s 392 Hemi is one of the most powerful engines available in the US market but SRT didn’t stop at just packing their Charger full of power. The Charger SRT8 features a Brembo brake package that makes it stop on a dime and new for the 2012 Charger SRT8 is a dual mode suspension system that – at the push of a touchscreen button – shifts the ride from sporty and smooth to super stiff for optimum handling performance. The Charger SRT8 is a great handling sedan in normal mode but when you pop into Sport mode, it is more like a 4-door supercar than a high performance large sedan. Any indication of body roll is completely removed in Sport mode and this race ready suspension program gives the driver a feel of the road like few other vehicles available in the US market. I have experienced other vehicles that offer a dual mode suspension setup similar to the one in the Charger SRT8 but I haven’t driven a vehicle that presents such a clear difference between the two modes. We are talking about a difference noticeable enough that even when just cruising on the highway and changing into Sport mode, the passengers in the car all instantly said “wow”. More importantly, when you hammer the throttle from a stop – there are very few cars sold in this country that are going to stay within a football field’s length. Between the roar of the Hemi and the shove-you-back-in-the-seat acceleration forces…there are few cars I’ve drive that provide such a brutally powerful driving experience. The 2012 Dodge Charger SRT8 very comfortably seats four adults with lots of room left over for cargo inside and in the truck but make no mistake – the 2012 Charger SRT8 is all sports car. The incredible handling capacities of the Charger combined with the violent roar of the 6.4L Hemi at high RPM will surely bring a smile to the face of any lover of performance vehicles. Some foolish old Mopar lovers might still gripe about the “extra doors” on the 2012 Charger SRT8 but in the end, the awesome performance capabilities of the 2012 Charger SRT8 are more than enough to hand a sound beating to any stock muscle car of the 1960s and 1970s (and many modern muscle cars) – in any performance venue be it a drag strip or a road course. The 2012 Dodge Charger SRT8 sedan is among the most powerful and best handling sport sedans in the world, offering a comfortable luxury-level interior packed full of gadgets, great looks and awe-inspiring performance. Most impressively, my fully loaded Dodge Charger SRT8 test vehicle does all of that for just over $50,000. Sure, that might seem like a whole lot of money to John Q Public but when you consider other high performance sedans available in the US – the Charger SRT8 is a smoking hot deal. Ford offers no sedan that can come close to competing with the Charger SRT8 and while the Cadillac CTS-V might best the Charger SRT8 – the super sporty Caddy carries an entry level price that is almost $15,000 more than the fully loaded SRT8 Charger. Other than the CTS-V, to find a full sized 4-door that will compete, we are forced to look at the likes of BMW, Mercedes Benz and Porsche. The BMW M5 offers more power and perhaps better performance but the BMW super sedan costs almost double that of the SRT8. The Mercedes Benz AMG CLS63 also packs more power than the Charger but like the BMW, it carries a starting price creeping up on the $100k mark. The Porsche Panamera offers the Turbo trimline with 500 horsepower (other lower trimlines offer less power than the SRT8) but the Panamera Turbo carries a starting price of $136,700…almost triple the starting price of the Charger SRT8. 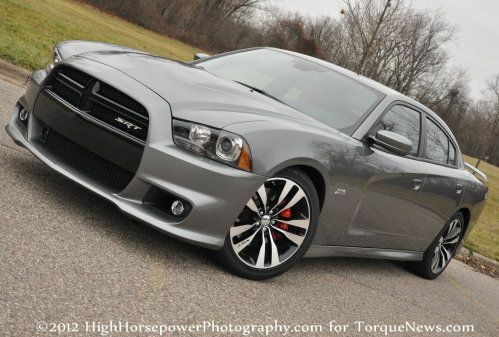 In short, by my estimation and opinion, the 2012 Dodge Charger SRT8 is the best bargain buy for those looking to get into a truly high performance sport sedan with luxury level interior amenities. More importantly, for under $50k, the Dodge Charger SRT8 goes a long way in redefining just what it means to be American muscle - with all of the capabilities that you would expect and room for four adults – this is one of the Ultimate American performance cars of all time. Check out the video below for a look at the 2012 Dodge Charger SRT8 in action and the gallery above on the right includes images of our Dark Silver test vehicle – inside and out.